North Jersey Bridal Soiree: Giveaway! A Princess for a Day Event! Predicament: You have a color palette in mind for a party, right? So now you want to give your client a choice, but they choose the colorway that you weren't so crazy about. What do you do? What's your 2 cents?? I don't have a solution and lesson learned for this one, because I didn't actually experience it full on. But if you have, please share experience.. Solution and Lesson Learned if any. I would make a suggestion and say why I like one over the other. But ultimately it's the clients decision. 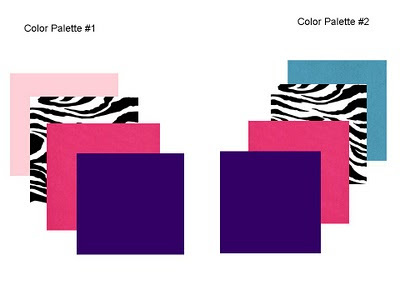 Which color palette do you like best for a little girl's Rockstart party? What's your 2 Cents!? Want to share your experiences for 2 cents Tuesday? Email me at www.theflairfactor@gmail.com with your experiences. Please include the predicament, solution, lessons learned(if any) and your 2 Cents! Can't wait to hear from you! OMG! Natasha! I am thinking of creating a rockstar party for my daughter's 3rd birthday celebration and my color choices are palette 1! I'm not sure where I found this color combo (maybe somewhere on the web). I went to Walmart this weekend and brought Halloween "Tutus" (Hot Pink, Purple, and Black) for only .50 cent each for the party girls (they were 90% off). So palette 1 - Final Answer!